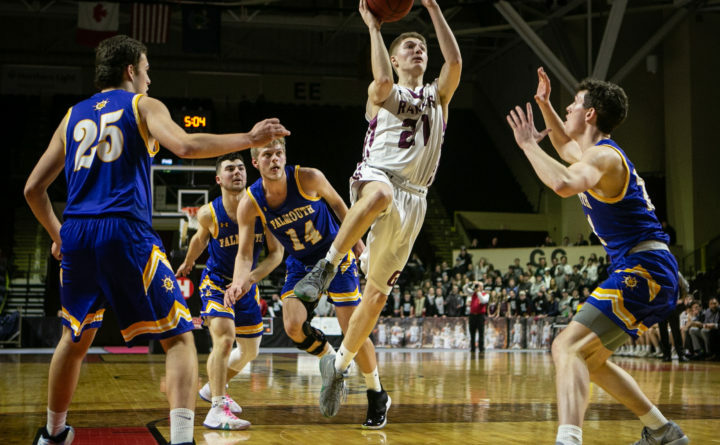 Greely High School's Zachary Brown weaves through the lane to take a shot in the boys' Class A South regional finals basketball game in Portland on Saturday at the Cross Insurance Arena. Two-time reigning Class A state champion Greely High School will get the chance to fight for a third straight title after ousting No. 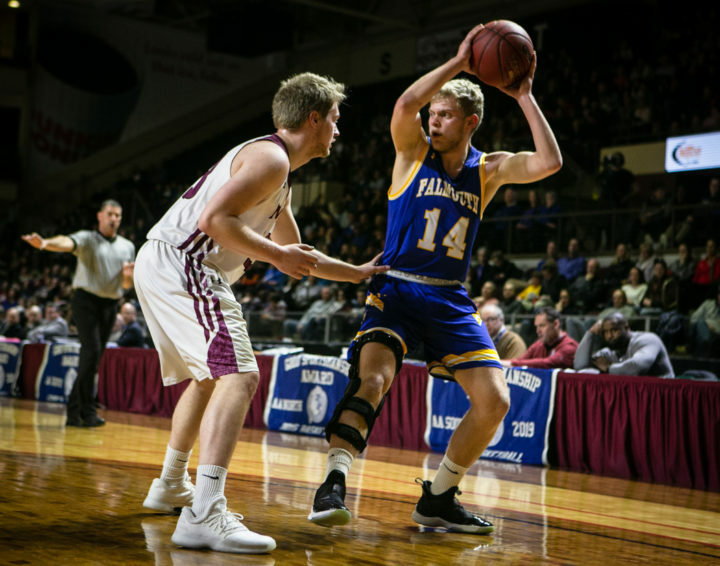 3 Falmouth 64-48 in the A South regional finals at the Cross Insurance Arena in Portland Saturday night. 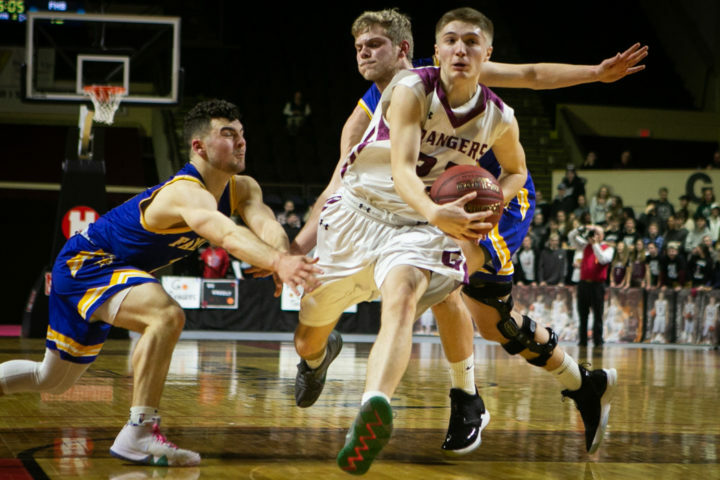 The top-seeded Greely Rangers (18-3) will face A North champions Lawrence High School on Friday, March 1 at 7:45 p.m. at the Cross Insurance Arena in Portland for the state title game. Falmouth High School's Nik Hester handles the ball in the corner guarded by Greely High School's Andrew Storey in the boys' Class A South regional finals basketball game in Portland on Saturday at the Cross Insurance Arena. The Rangers have won two straight gold balls, beating Hampden Academy last season, 47-46, and Messalonskee High School of Oakland in 2017 by a score of 59-43. Greely defeated No. 8 Mt. Ararat 70-46 in the quarterfinals before topping No. 5 Kennebunk 69-62 in the semifinals. 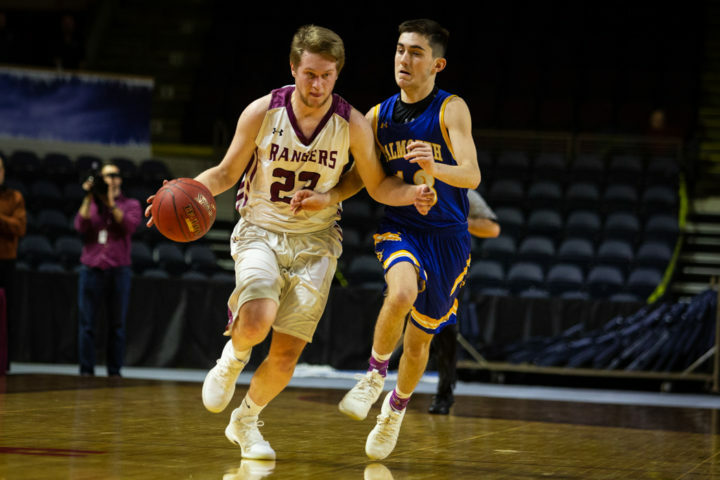 Falmouth High School's Mike Simonds has the ball in the corner guarded by Greely High School's Michael Coppersmith in the boys' Class A South regional finals basketball game in Portland on Saturday at the Cross Insurance Arena. Falmouth’s season ends with a record of 15-6. It was the seventh time the Yachtsmen have appeared in the regional final in the last eight years. Falmouth was defeated by Greely, 49-47 in last year’s semifinal round. Falmouth won the state title in 2016. Falmouth defeated No. 6 Brunswick 45-31 in the quarterfinals, before upsetting No. 2 York 48-37 in the semifinals. 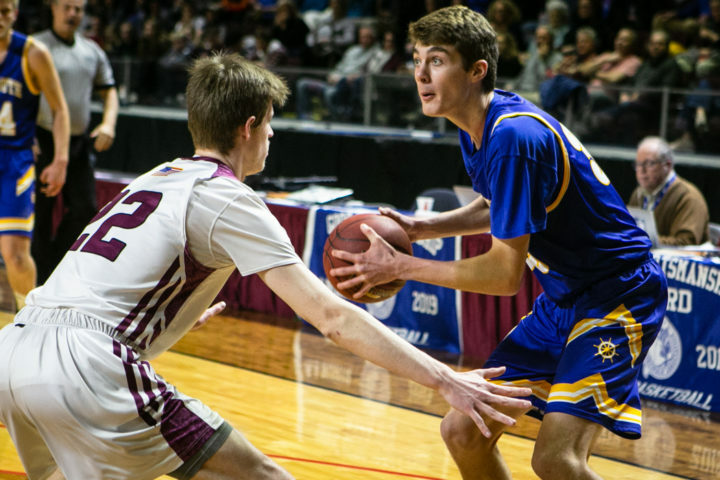 Greely High School's Michael Coppersmith brings the ball up the court guarded by Falmouth High School's Brady Coyne in the boys' Class A South regional finals basketball game in Portland on Saturday at the Cross Insurance Arena.